The new Kanger Protank 3 is Kanger’ s answer to the age old question, how can you make a great product better? It is made of Pyrex glass, is a bottom coil and can be completely disassembled; similar to the Protank 2 and other Kanger Clearomizers. 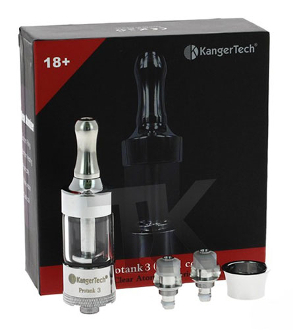 The Kanger Protank 3 is a fantastic upgrade from the Protank 2 because it is duel coil. Having a duel coil means that there are two heating coils instead of one and they work together to give you a superior product with little to no gurgling and leaking. This also means less airy hits and more vapor. A small amount of liquid can leak from the mouthpiece when you’re changing the coil (wicks) or adding liquid, since the seal is temporarily broken when the base is removed.